Actual size is 4" x 8 1/4"
Johnny Evers didn't wear garters on the field, as that mid-calf strap would've been painful anytime he slid, but baseball's high socks style does draw your eyes to the right part of the body. Actual garters clipped to socks (under longer pants) and kept them from sliding down as men went about their day. 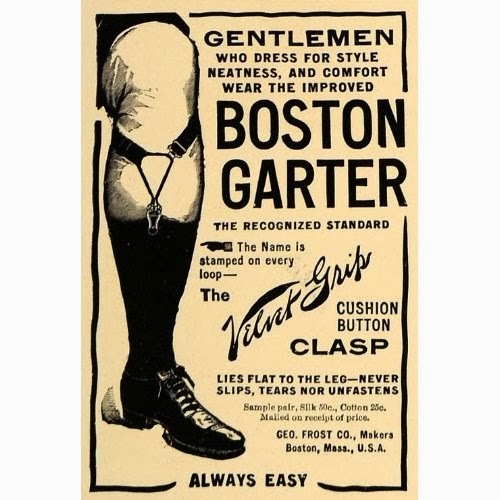 Boston Garter printed three different placard sets for promotional use at men's clothiers, available by request for retailers themselves. Today's 1914 issue likely entered circulation as supplies waned from 1912's set of 16 players. As a window eye-catcher for passing customers, cards would've been used mostly during baseball season. Today, we think of checklist numbering as an aid to collectors, but the bolded This is Picture Number 5 tagline probably helped shops know which players to request from Boston Garter. Early hobby catalogs dated this set to late 1913--just late enough to include that season's hitting and fielding stats--but #12 Buck Herzog also mentions his becoming Reds manager for 1914, which would've happened no earlier than his Dec 12, 1913 trade from New York to Cincinnati. Modern collectors agree on 1914; compare checklists and designs at Old Cardboard. Value: Boston Garters type cards auction for $2000-5000 each in low grade, running much higher for superstars Ty Cobb and Walter Johnson. The 2004 Robert Edwards auction I used for these images closed at $8050 for two cards, #5 John Evers and #12 Charlie Herzog. Helmar Brewing's "H813-4 Boston Garter"